This is a thick slab (sawn on both sides) of a biotite-pyrite-chalcopyrite rich ore that has some molybdenite, a few quartz crystals in it, and supposedly uraninite (or pitchblende). 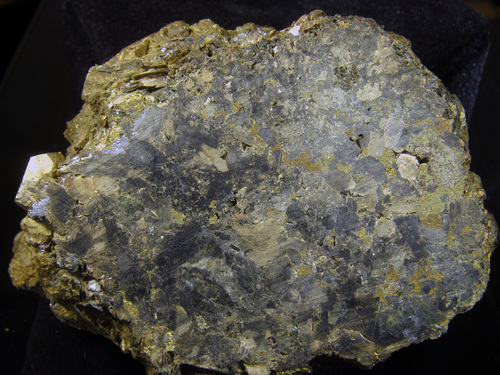 In this picture, the black is mostly biotite, the pyrite, chalcopyrite, and molybdenite should be obvious, and no quartz or uraninite is discernible at this resolution. The specimen is mildly radioactive on my inexpensive, non-alpha-sensitive, Geiger-Muller counter. See child photos for both sides of the slab and a close up of the one large euhedral pyrite crystal. According to the label, this specimen is from "Tunnel 3." 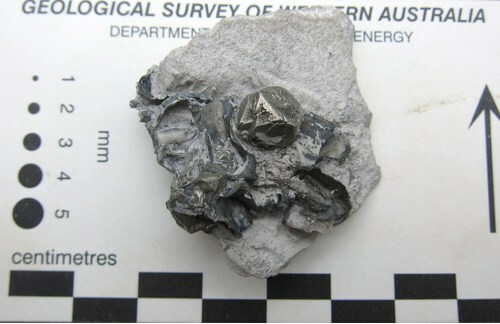 Several smaller (for the locality) crystals of pyrite on and around fossil shell material, with attached limestone matrix. Shell material is at least 2 species, possibly Inoceramus and Pseudoperna, with the Inoceramus remaining entirely calcite and the Pseudoperna mostly replaced by pyrite. 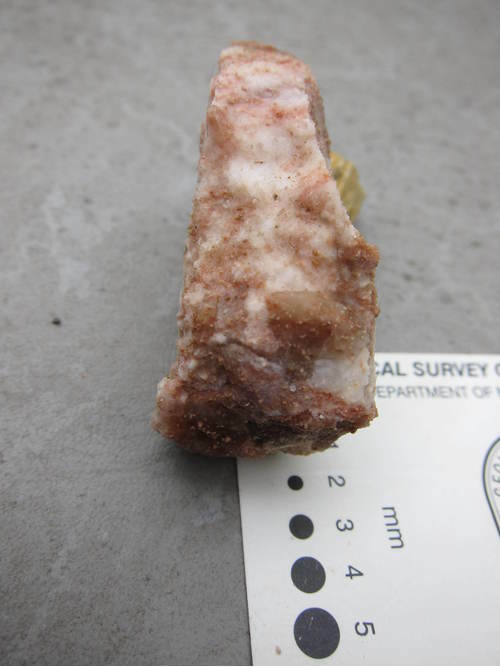 Pieces of massive, microcrystalline gypsum with bright red staining are fairly rare but can be found scattered in the quarry rubble. 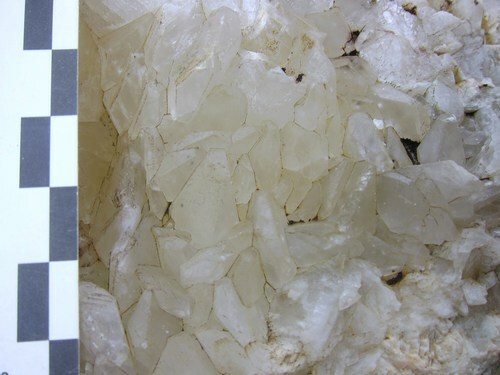 Some of these pieces contain larger subhedral crystals such as the two seen on the end of this piece (somewhat central in the image itself). According to the reference, gypsum can be found commonly in the bedding planes of the Eagle Ford shale, the unit stratigraphically below the Austin Chalk that is exposed within the quarry and occasionally dug into by the operation. Some gypsum is also reported within the basal phosphate pebble conglomerate, which is exposed in places within the quarry. I have not yet personally observed any in-place gypsum in 4 visits to the quarry. Well-formed calcite crystals found in a pocket within recrystallized fault gouge/slickensides of the Austin Chalk in the quarry wall. 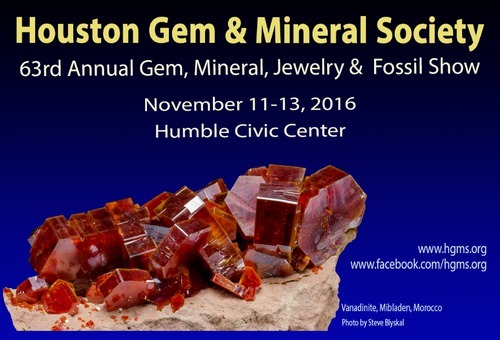 Quartz (var chalcedony/agate) replaced gastropod from the Brushy Basin Member of the Jurassic Morrison Formation. Composite image from 6 stacked photos taken by a USB microscope. 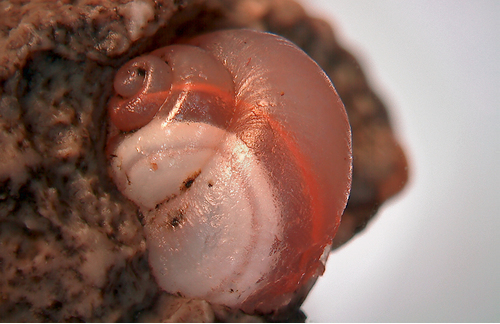 Note: these silicified gastropods are fairly well known in the literature, cf. Holt, E.L., 1942. Jour. Paleontology, v.16, n.4, pp.456-460.